There’s lots of things you can as part of your Irish learning, and Bitesize Irish Gaelic online lessons is only a small part of it. Immersion in the language lets your brain flip to a new language. You can help it by actively learning, or even by passively watching. TG4 Irish language television is such a rich resource for learning Irish online, I think we take it for granted. You may be an avid watcher already, or you may never have heard of TG4. Either way, you can use this week to find a new TV show on TG4 to watch. Go to http://beo.tg4.ie/ and the live stream is on that page. Go to http://beo.tg4.ie/ and click on one of the category buttons (like Siamsaíocht/Entertainment). Show tip: “Garraí Glas” (green garden) is a favorite of ours. They visit people who grow their own veg, and you get to see gardens around the Irish countryside. Find it under the Siamsaíocht/Entertainment category. Which TG4 shows do you like? Want to sign-up for all Bitesize Beo videos(for free)? Click the following banner! Any music doc produced by Sibéal Teo. They’re the work of Niamh Ni Bhaoill who runs the Ballyferriter Scoil Cheoil an Earraigh with the amazing West Kerry musician Brendan Begley. Next best thing to hearing trad. music live in the pubs is watching it on TG4. I’ve been addicted to Ros na Rún for over a year now. I love their drama programs. Seacht, Aifric, Corp agus Anam…. most of the dramas they show are great! and I like the Idir Mna series they’ve shown over the past year or so. It’s entertainment, but also a cultural look at Ireland, and I do pick up vocabulary words while watching, as well. I make it a habit of watching/listening to TG4 as I am getting ready in the morning. It really does help to get your brain accustomed to the language. I am already understanding words in the reports! Ros na Rún beats most English-language soaps I’ve seen or written for. It also features Peadar Cox, a super actor and a brilliant villain. An awfully long time ago, when we were both students, I toured Irish language plays with him round the Gaeltachtai. Then I went off and became a writer in London. He stuck to his roots and became a household name. Now I live in both London and Corca Dhuibhne, where I’m writing this. TG4’s one of the things I miss most when I’m on the other side of the Irish sea. I love Ros na Rún! I am soooo addicted. I also love watching Aifric, Bean an Ti sa Chistin, and lots of the documentaries. So much fun! 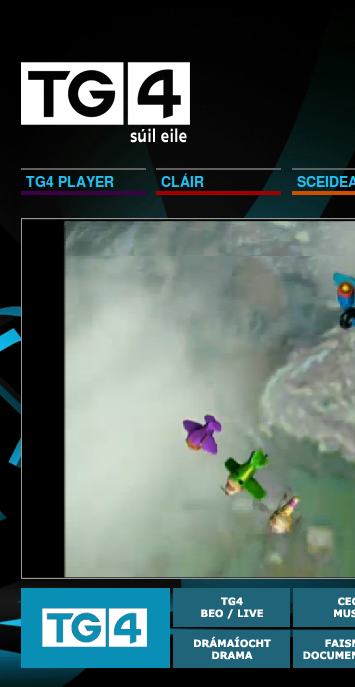 PLEASE,can somebody give me a ckue as to what happened to TG4 SINCE they supposedly upgraded it ? Prior to this we had absolutely no problems with their stream ,but now the “links” when you click on the program are dead—cookies,privacy and even the spyware has been adjusted with no difference—TG4 still works fine after a first time slow_ness on another computer–but on this 1 ? no way….however,every single other “stream” from japan to even RTE etc still comes in fine. WE really miss Ros na Run and there were those from greece,spain and ecuador crowded around this tiny laptop twice a week enthralled ! We watch Garrai Glas, Muintir na Mara, Geantrai, Ceol on Chartlan, but my recent favorite is the series about Innishmaan called Ag Bogadh go hInis Meain. Absolutely lovely. We have a special place in our hearts for Garrai Glas, however. Such an excellent and informative series. If there are any other stations that stream, please send us a line! Thank you! Ag Bogadh go hInis Meáin sounds lovely. It’s a really nice island.